See the process at work and get inspired! View sectionals our customers have created! 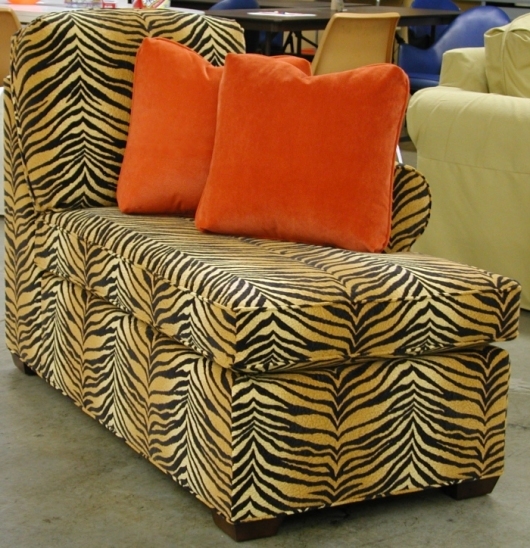 View furniture in various fabrics! Because we are the manufacturer, you can make dimension modifications to our standard styles when needed. Below are just a few examples of custom modifications our customers have made. Photos are positioned above the stories. Be sure to start the shopping process by checking out our standard styles, dimensions and prices by using the links on the left hand side of this page (sectionals, sofas, sleepers, etc.). Call us at 1-800-653-9757 or email us if you have questions or want a quote for making a change to our standard style. Note: If you do not receive an email response from us, please check your SPAM folder. Note: Use Ctrl + F to search for a specific word or term in this section or use your edit, find function on your browser. Click photos for larger view. William and Patricia needed smaller-scale furniture for their circa 1800 New England Cape and were in love with the Eliot style. They made a few adjustments--replacing the skirt with 4.5" spool feet, increasing the height of the arms, and decreasing seat depth. They asked if it was possible to create a single cushion love-seat instead of the standard multiple cushions. Of course - no problem. They didn't want the furniture to be too “matchy” so opted for complimentary fabrics--Canton Linen and Canton Natural with our Special Request fabrics Collage Sage and Dainty Mojito. William and Patricia are delighted with their new furniture--perfectly proportioned for their older home. Kaley is a new homeowner and excited to purchase a custom sectional Made in America. Kaley wanted to add a couple of stainless steel cupholders to the arms of their sectional. These cupholders are really nice and removable for cleaning purposes. We have to increase the arm width by 1.5" for the cupholders to fit, which makes the arm width of our Crawford or Hall style 6.5". Kaley's fabric choice was Topeka Driftwood and their Crawfrord style sectional consist of a LF full sleeper, corner chair, and RF loveseat. Kaley upgraded their free ottoman to be storage for only the differnce in cost of the two ottomans ($80). The dimensions of the sectional are (L to R): 102.5" x 90.5"
Mary Grace and her husband loved our Kingsley style and wanted to know if we would make a 2-piece sectional in that stand-alone style. They opted for no bottom round on the Kingsley style arms and wanted to increase the seat depth to 26”. Mary Grace needed the specific final dimensions of (L to R): 68” (overall depth of LF Chaise) x 105” in order to fit her space - 35” chaise and 70” sofa. They selected Bayport Midnight/Ocean as their fabric choice. Amy loved our Roth style sectional but wanted to make a few simple custom changes. She wanted to use our 5” border seat cushions which adds an inch of thickness to the cushions and change to single seats for the two loveseat components. Amy selected Special Request fabric Underwood Autumn. The finished dimensions are: (L to R) 103.5” x 103.5”. Ashley Google searched “build your own furniture” and found us on the internet (thank goodness). She loved our stand alone Kingsley style and wanted a sectional in that same style. She selected a LF love seat, corner wedge and RF loveseat. Ashley added nail head trim in our Old Gold ‘Z’ finish and 3” tapered wood feet. Her fabric selection is Rockville Ivory. Please be sure to read Ashley's testimony on our website (2016 - on 9/9/16) and View sectional in Ashley's home. Anne wanted to redecorate her living room and wanted somthing a bit classy. 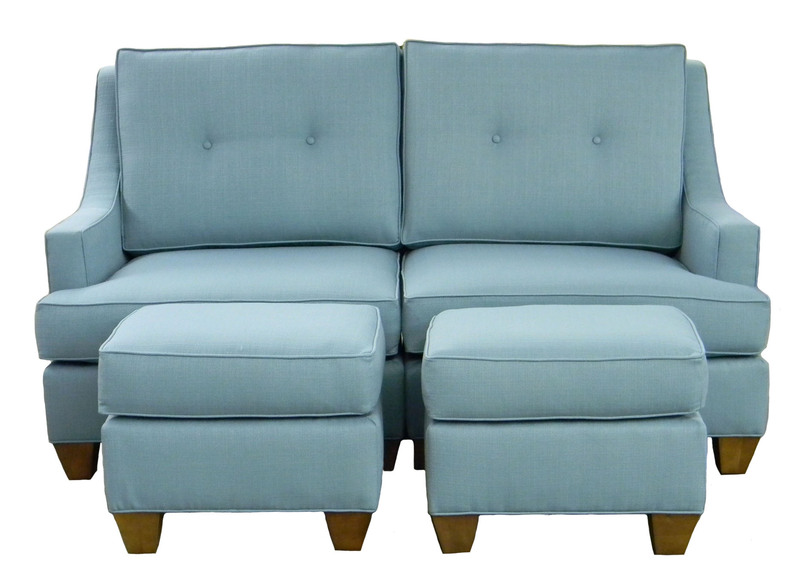 She loved our Kingsley collection, but needed the two sofa's to be 4" shorter than our standard dimension of 88". No problem. We are a custom builder anyway, so making changes is easy and does not cost you an arm and a leg! Anne added our Hammered Oxford Finish nailheads which looked great! She wanted a large button-tufted cocktail ottoman to use for entertaining. 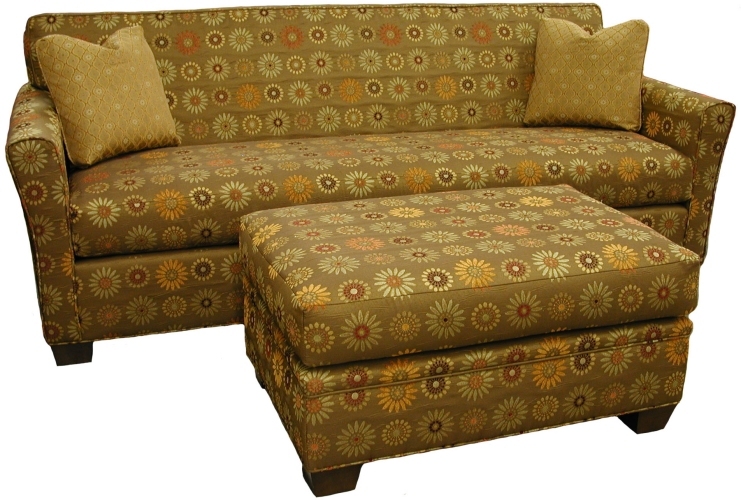 The ottoman is 36" x 36" x 19" and the legs are our 8" turned style. Anne seleced our Polyurethane Atlanta Walnut as her fabric covering. Martha wanted a large sectional for her family room and wanted high quality and Made in America. She fell in love with our Kingsley style collection and asked if we could make a sectional that looks similar, including the 5" border seat cushions that we use on our Kingsley style. We've done it many times! She chose our Microdenier Fairview Dark Blue fabric and sent in COM (customer's own material) for many of her throw pillows. Her custom Kingsley style sectional consists of a LF sofa, corner chair, armless chair and RF sofa. Finished dimensions are 120.5" x 146.5". She added (4) 16" throw pillows and (4) 18" throw pillows. 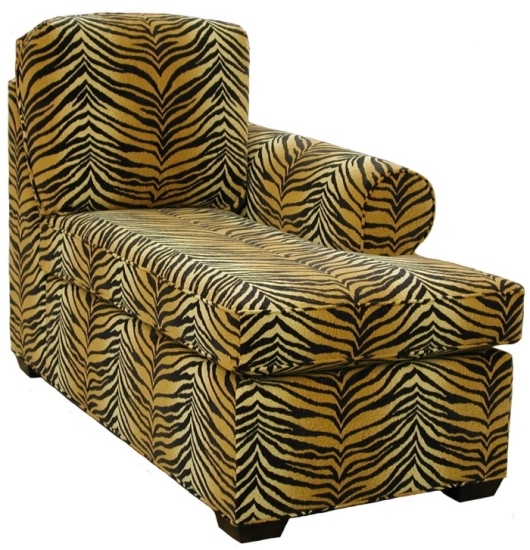 William wanted to add a chair to his living room and loved our Kingsley style. Because the chair would sit in a unique place in the room, he wanted to add decorative nails on the front and the back of the chair. He added our hammered oxford finish nailheads around the arm facings, around the front border and around the out-back of the chair. It looked great! He selected Bayport/Topaz Pecan as the fabric and Sultry Suede Sepia for the contrasting throw pillow. Okay, you have to admit, this is definitely a fun looking sectional! It’s perfect for the youth group room at any church. And that is exactly what it is. A local church needed a fun and crazy sectional for their fun and crazy teenagersJ. They wanted a wild looking one, so we selected and sent them a variety of fabric swatches and asked them to choose fabrics for each component. They put together something certainly unique and the teenagers loved it! What a great idea! 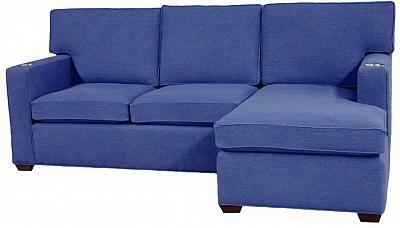 The sectional can seat a whole bunch of kids and components can be pulled out for individual use when needed. 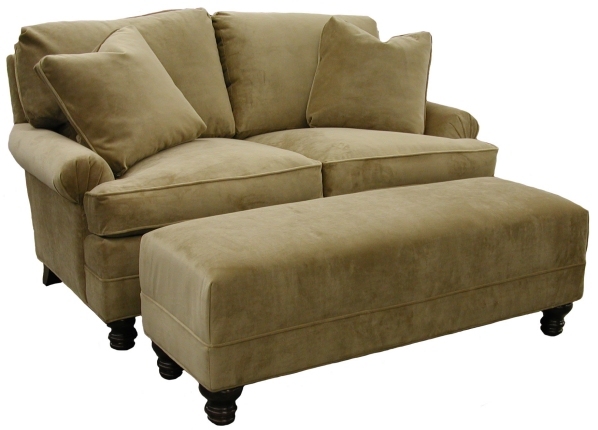 The Crawford style sectional is 181” x 191” x 181” and consists of (3) armless loveseats, (6) armless chairs, (1) corner wedge, (1) curved corner wedge, (2) corner chairs and (4) ottomans. Bill and DeDe wanted quality furniture to put in a very small room that would serve two purposes: daily TV watching and an occasional guest bedroom. They rejected sleeper sofas because of space constraints and were looking for a sofa that they could “convert” into a bed by removing all cushions and placing a homemade platform on the sofa that would accommodate a twin size air mattress. After an endless online search, DeDe emailed us as a last resort. She sent us very specific emails with pictures and diagrams attached, asked lots of questions, requested samples, and even constructed a foam-core-board mock-up of the furniture just to be sure it would fit through the doorway of their small room. We started with our Hall style frame and made the needed modifications. The sectional pieces have a custom arm style based on a photo she shared with us, 4” tapered fruitwood feet, an overall length of 34”, an increased frame height of 37”, and an upgrade to metal sectional connectors. The arm width is 4”, arm height 23”, and the custom arms were inset to accommodate a T-seat cushion. The seat cushions have 5” borders and the back cushions are square bordered poly with fiber-wrapped and have (1) row of (2) buttons on each side. The custom ottomans are 22” in length and 15” deep. Bill and DeDe trusted us to make their furniture wishes come and we did just that. Fabric used was Rockville Laguna. Beata was ready to replace her 30 year old (but very good quality) furniture in her family room. She needed a large sectional with firm seat and back cushions and a peformance fabric (duable and easly to clean) to be able to withstand the three big 'lounge lizards" in her home. They preferred single seat cushions as they frequently were in the horizonal position. She lives in an older home in Brooklyn and her hallway is narrow (30"), so that was a factor that needed consideration as she selected the frame style. Her custom Roth style sectional with bordered back style back cushions consists of a LF sofa, (2) armless sofas with LF returns and an ottoman. Her custom sized sectional is (L to R): 118" x 118" x 82.5". Beata opted for bun feet and used Microdenier Baltimore Merlot as her fabric covering. Darla and Tim were shopping for high quality furniture on the web and found us. They wanted furniture for their family room and wanted it to be a work of art. They mixed fabrics and created an eye catching design that turned out great! They chose our Kingsley style for the sofa and loveseat and a custom sized Wordsworth round ottoman. We increased the standard ottoman to a 36” diameter with a height of 16.5”. Their fabrics include Bayport Burgundy/Cognac, Sultry Suede Sepia and COM. 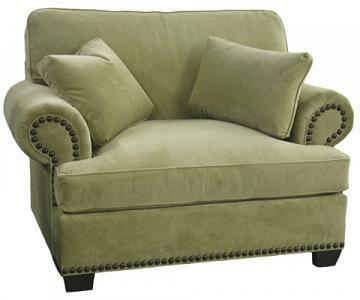 We included nailhead trim to the sofa and loveseat. Their creativity amazed us. Penny was shopping for a new sectional and showed us a photo of the style she liked and asked us if we could build our version of that style. The sectional reminded us of our Crawford style, but it had slightly curved arms and a tight back (instead of back cushions). She also had a quite unusual request (but thoughtful and sweet) regarding the ottoman. Their dog is getting older and has a hard time jumping up on their current sofa. She wanted us to make an ottoman lower to the ground and with a solid frame on top to support the weight of the dog so he could use it as a stepping stone onto the sofa. What a great idea! Penny upgraded her seat cushions to a 5” border (more support) and selected Montego Lapis as her fabric covering. Her custom 2-piece sectional consists of a 30” LF chaise and a 62” RF loveseat. She added (2) 16” throw pillows. Casey and his wife Janine made an addition to their home and wanted a large sectional using our Kingsley style arms. They were interested in leather at first, but we told them about our polyurethane fabric which is as tough as leather (if not tougher). It’s also spot cleanable with soap and water. They like idea of a two-toned sectional, so they used one color for the cushions and another color for the frame. We included a 7” front border (you can see this application across the front of the frame) and our Old Gold ‘Z’ nailheads around the arm facings and the front border. They opted for our poly back cushions and our 5” border seat cushions. Bun feet were used along with metal connectors which have a tighter grip on wood or tile floors which can be a bit uneven. Their modified Roth style 4-piece sectional consists of a LF loveseat, curved corner wedge, armless loveseat and RF sofa. Finished dimensions are (L to R): 156.5” x 130.5”. Polyurethane covering is Atlanta Pecan and Atlanta Bronze. Optional Throw Pillows are in Microdenier Baltimore Moss and Aubergine. Ann found a sectional style she liked in a magazine and asked us if we could manufacture a similar style, but include angles to create two angled components on the ends. She created a sketch and emailed it to us showing the angles she needed (135 degrees) and indicated she wanted to incorporate an armless queen sleeper with Ultra Air Dream mattress in the middle between the two angled components. We started with the Crawford style frame, and although we couldn’t recreate the arm style in the photo exactly, we used a modified Keats style arm and sloped it down from the back of the frame to produce something similar. Her 3-piece custom sectional consists of a 36” left facing chair, 71” armless queen sleeper and a 30” RF chair. Ann chose our fiber down cushion package and Microdenier Baltimore Peacock fabric. Jacki emailed us indicating that she was looking for a sofa between 84” and 89" long because she is 5’9” and wants to lay down on it. The sofa will go into her upstairs office (her husband calls it her “girl cave”) and she will be using it for naps and watching TV. She told us her doorway may be an issue as it is only 29” in width. She liked the style we built for Lenny (on this page), but did not want T-seat cushions. We made modifications to the frame so there would be no issue in getting the sofa up the stairs and through the doorway. Her modified Crawford style sofa is 88” in overall length, 74” in seat width, has a 28.5” frame height, a 7” arm width and 23” arm height. Jacki used our Byron style back cushions and increased the seat cushion border size to 5” (increased thickness of the seat cushions). She loved our soft Jackson Flannel fabric. Nitya was looking for a new sectional for her home and loved the style we built for Jill (further down on this page). However, she needed a different configuration to fit her space and wanted to make some changes to the design. Nitya wanted a seat depth of 25” (very deep seat depth) which increased the overall depth of the sectional. The components are a LF loveseat, curved corner wedge, RF sofa and custom sized storage ottoman (32” x 22”). She added (4) 20’ x 20” throw pillows and (1) 18” x 18” throw pillow. Nitya selected Microdenier Baltimore Cashmere as her fabric with contrasting welt in Microdener Baltimore Black. Finished dimensions are (L to R): 108” x 127”. Stuart and his wife wanted a pit group design for their family room, but had a certain space limits. They looked for high quality furniture Made in the U.S.A. and found our website. They liked our Roth style, so we customized the lengths of the LF and RF sofas and the storage ottomans in order to fit the space they had available. They selected various Special Request fabrics for their throw pillows and storage ottomans and Microfibre Bromley Sky as their sectional fabric. Finished dimensions are (L to Center to R): 115" x 122" x 115". Sharon was redecorating her den and wanted high quality furniture, Made in the USA. Thank goodness she found us! She liked our Kingsley style and asked us to leave off the bottom round (curve) of the arm, making the arm come straight down. We were happy to make that custom change. 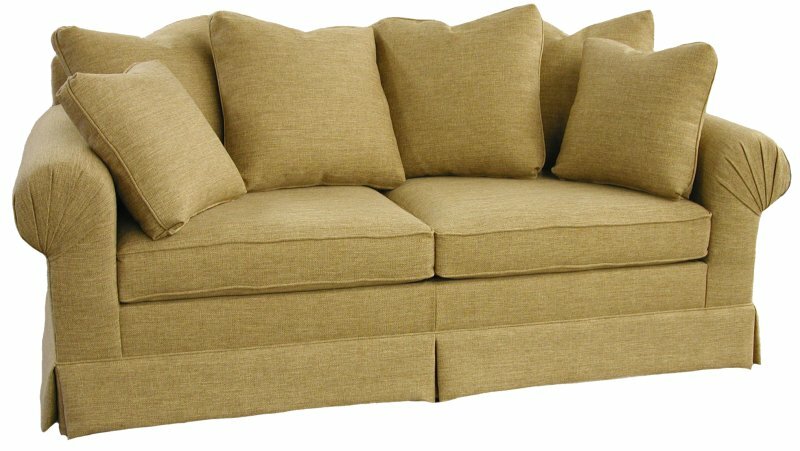 Sharon ordered a sofa and loveseat and participated in our customer’s own material (COM) program, which is one of three fabric options we offer. Susan called and said that she needed a sectional to fit her space which would require some customization on the length of one side. Not a problem. She liked our Kingsley style arms and wanted to incorporate them into a sectional style using square bordered back cushions. We customized our Roth style frame and added our Kingsley style arms. She upgraded to our premium support package which re-enforces the frame and adds (1) inch to the seat cushion borders. Her Kingsley storage ottoman is 37” x 25” x 18”. She requested our 2” tapered wood feet (fruitwood finish) and added (6) 20 x 20” throw pillows. Fabric choice was Sunbrella Linen Sesame and finished dimensions are (L to R): 91.5” x 105.5”. 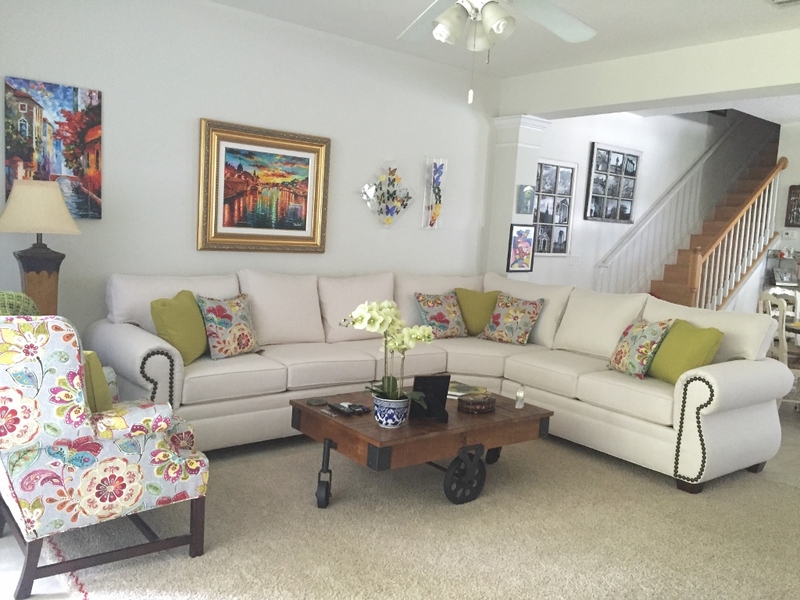 JoAnn was looking for new furniture for a remodeled room in her home and loved Sue’s skirted sectional style in this custom inspiration gallery. She wanted to maximize seating in her small space and chose our curved corner wedge which has the same seat depth as the other components of the sectional. She needed a specific length for her space and we were easily able to accommodate making length changes to both the LF and RF components. JoAnn chose our Roth style sectional and changed the rounded back cushions to a bordered back style (like our Yeats sectional style) and used our poly back cushion option. She increased the seat cushion border to 5" (from our standard 4"), added a 7.5” kick-pleat skirt and (3) 16” throw pillows. Fabric choice was Microdenier Baltimore Honey. Finished dimensions are (L to R) 82” x 93”. Patrece, a designer in Georgia, was working with a client that wanted a sectional in a special Sunbrella fabric for their sunroom. They were especially interested in high quality furniture made in the USA. Patrece liked our Crawford style and asked if we could add a second arm to the recliner component so her client could rest both arms. That’s an easy customization for us to make. The client wanted a little more neck support, so we added 3” to the cushion height making the overall height about 40”. They wanted supportive seat and back cushions, so they chose our poly back cushion option, our standard seat cushion option and opted for our 5” border seat cushion (adds thickness to the seat cushion). 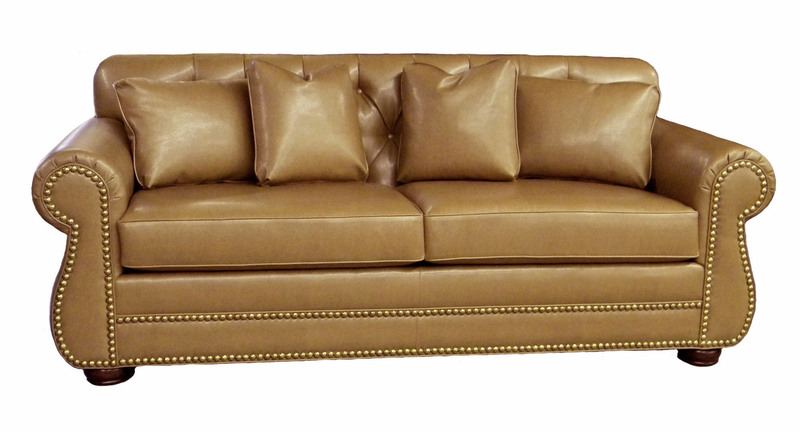 Finished dimensions of their custom 4-piece Crawford style sectional: (L to R): 90.5" x 121". Fabric covering is special Sunbrella Simone Flame. Throw pillows were C.O.M. Cheryl and Richard were redecorating their home and wanted quality furniture made in the USA. 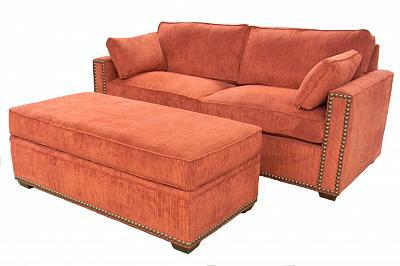 They loved our Kingsley style and asked if we could manufacture two custom sofas as a button-tufted, tight-back style (yes we can!). They also wanted to add nail head trim around the arm facings and around the front border. They fell in love with our new polyurethane Atlanta Bronze fabric which it durable and easy to clean and maintain. 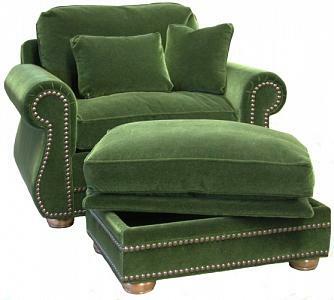 Their custom Kingsley style sofas are beautiful. Zoe wanted a small “pit” design for her bedroom that incorporated a storage ottoman. She had the space in mind that she wanted to fill, so she told us the dimensions she had and the style she liked. We created a custom 2-piece Byron style sectional which consisted of a custom sized armless loveseat with right facing return and a custom RF love seat. Finished dimensions are (L to R): 57” x 95”. The storage ottoman is 59.5" long x 21.5" deep. Zoe participated in our C.O.M. program for the fabric covering. Ben and his wife were looking for quality furniture made in the USA. Ben said he and his sons were “big guys” and wanted to include our premium support package on his furniture (re-enforced frame and increased border size of seat cushion). They wanted a sectional for the living room and a sleeper for the den. They loved our Henley style arm and wanted to use it on their sectional, so we modified our Crawford sectional style to make that happen. They chose our poly back cushion option and 3” tapered wood feet. Ben selected multiple fabrics (Microdenier Baltimore Chinoand Special Request fabric Berkeley Caper) for their custom style sectional and our Polyurethane Atlanta Bronze and Microfibre Montego Toast for the matching Queen Sleeper (with Air Dream mattress upgrade). 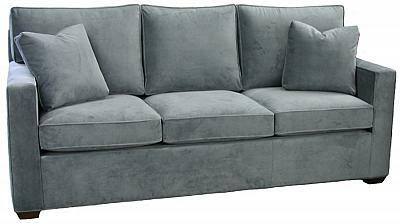 The modified Crawford style sectional consists of an 81” LF sofa, corner chair, 56” RF loveseat and (2) storage ottomans. Ben and Rosa visited a high-end furniture store in Destin, Florida and saw a perfect (high quality) sectional that would allow their entire family to comfortably watch movies. However, there were two problems: the cost was astronomical and they couldn’t customize to get the exact fit for their family room. They went home and searched the web and found us. They loved the Nancy and Bob style arms (in this section), so we modified our Byron style sectional to include that arm style. They shared with us the dimensions they had to work within (including a special angle for the corner wedge) and we built the sectional for a perfect fit. Among the various changes, they increased the border size of the seat cushions to 5”(making the cushion thicker), increased the seat depth by 3” (making it 24.5”), added old Gold Z nailheads, block wood feet, and selected fiber down seat cushions. They used our Chenille Modesto Wheat for the sectional and an assortment of our fabrics and special request fabrics for the various throw pillows. 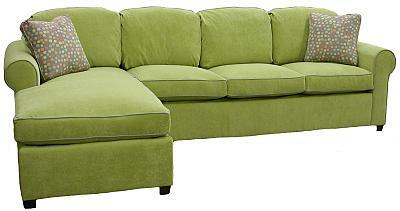 Lois wanted to replace a sofa in her home that was very uncomfortable. She wanted a queen size sleeper, but didn’t have a lot of space in the room. She liked our Crawford style and wanted to know if we could make a 2-arm style (and we can very easily). Lois wanted us to make several changes to the style. She wanted to increase the border size of the seat cushions to 5” (making the cushion thicker), increase the back cushion height by 1”, add old Gold Z nailheads, and make a matching large Roth style storage ottoman (52” x 25”). She chose our fiber down cushion package and participated in our C.O.M. (customer's own material) program. Her furniture was gorgeous and she loved it! Sylvia and her husband moved from Indiana to Texas and needed new furniture for their home. They wanted a large sectional and liked our Byron style, but wanted to make some changes. They increased their LF sofa to be 109” (providing 4 seats), changed the feet to our 3” tapered wood feet, and changed the back cushion style to our Crawford style “middle” bordered back style making the overall height 37”. They liked the idea of a storage ottoman and wanted to increase the size to 39” overall length x 36” overall depth. They can store many blankets and other items in their large storage ottoman! They added (10) 20” x 20” throw pillows. The fabric combination is Microdenier Baltimore Black and Sultry Suede Fawn. 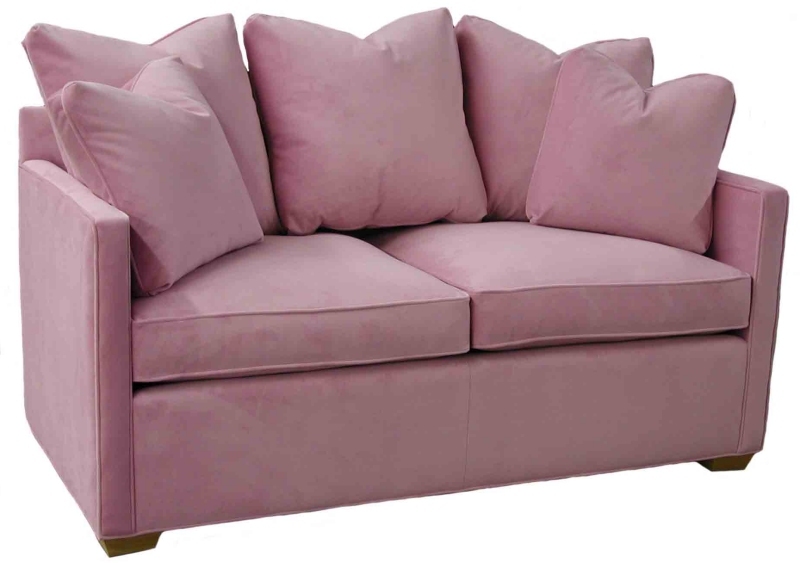 Sylvia’s custom Byron style sectional consists of a LF sofa, corner chair, armless loveseat and RF chaise. Finished dimensions are (L to R): 144.5” x 119.5”. Debbie was looking for a long, modern, sleek, contemporary sofa. She browsed the custom creations on these two pages and loved our fan pleated arm style. 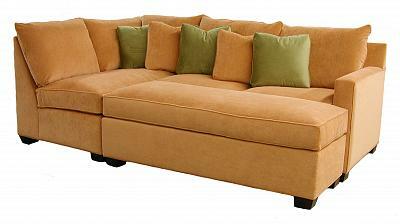 She wanted her sofa to be 124" in overall length, have bordered back cushions, and a larger seat depth than typical. We used our Hughes style frame and made changes to create the look she wanted: switched the rolled arm style to fan pleated, added 4" to the seat depth (making it 26"), added bun feet, and changed the back cushion style to our bordered back style. Debbie upgraded the (2) 16" throw pillows to 18" throw pillows. Her fabric is Microdenier Baltimore Espresso. Ted and Sandra wanted to replace a sofa in their den that was sitting in a perfect space for a sectional. They were so happy to find our website with our high quality construction and were thrilled that all our furniture is Made in the USA. They wanted a more formal look for their room and decided to add a skirt on our Roth style sectional. They opted to change the back cushion style to the square bordered backs of our Yeats style. Their custom Roth style sectional consists of a LF sofa, curved corner wedge, and a RF chair. Finished dimensions are (L to R): 128" x 78.5". They upgraded their free ottoman to be a storage ottoman. Fabric choice was Microdenier Baltimore Ocean. Diana was looking for a sectional to work in the space of her new family room. She was considering incorporating a chaise, but she browsed this page of our website and liked the concept of a stump-end (like in Mike's design) because there would be more seating options for guests or her schnauzer :-). Diana liked our Byron style, but wanted to increase the seat depth by 1.5" making it 23.5". She also upgraded to 5" border seat cushions and opted to participate in our C.O.M. program where the customer provides their own upholstering material. Finished dimensions of her 2-piece Byron style sectional are (L to R) 74" x 119.5". Robin and her husband have a small living room had just bought a new fireplace insert when she called hoping we could customize a loveseat so they could enjoy the fire together. She mentioned she wanted all down cushions because the only loveseat has really "loved" is the one her dad had with down cushions. Robin and her husband recently moved to Colorado and they love the western themed furniture, so they chose our Kingsley style and incorporated nail heads into their design. Since the back of the loveseat would be seen upon entering their home, they added Old gold 'Z' nailheads on the back of the loveseat for more visual interest. Their multiple fabrics include our new Microdenier Bayport Pearl (soon to be added) and Microfiber Fairview Dark Brown. Art and his wife needed to replace their loveseat and wanted a piece a little longer than what they currently had. They liked our Eliot style, but wanted a T-seat cushion and a higher armrest for more back/head support when laying down and watching TV. 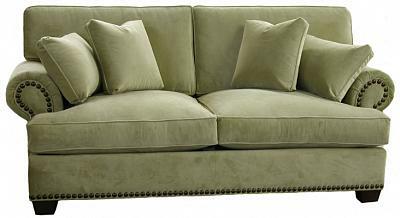 We modified our Eliot style loveseat to be 71" in overall length and raised the arm height 5.5" to 27.5". They selected Special Request fabric Geldof River. 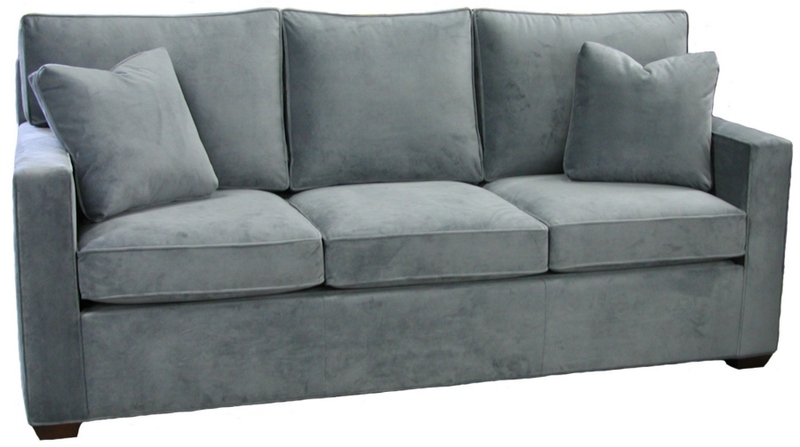 Jill, a designer in New York, had a specific style of sofa in mind but wanted the high quality construction that we offer and just couldn't find it until she found us on the internet! She was thrilled when we responded to her email and the photo she sent telling her that we could manufacture something similar. 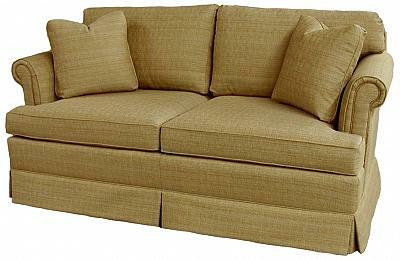 Jill's custom 2-piece scattered-back sectional consists of a LF loveseat and a RF chaise with a 10" kick-pleat skirt. Finished dimension are (L to R): 118" x 62" (depth of chaise). We increased the border size of the seat cushions to 5" (increased the thickness of the cushion) and Jill chose our fiber down seat cushion and our standard back cushions. She participated in our C.O.M. program. By the way, this furniture was for her (not a client) and she loved it! We look forward to working with her again. While the vast majority of our furniture is for the residential setting, we do manufacture for commercial establishments. We built 6 chairs for an auto repair business for use in their waiting room and 10 booths for a new restaurant, Chez Liberty, now open in Knoxville, Tennessee. For both applications, we used our soft-to-the-touch polyurethane fabric which is as tough as shiny patent leather and easy to clean with soap and water. Our Atlanta polyurethane has a supple hand and creates a soft pebbled leather-look. We have a variety of colors and it works well with traditional, transitional and contemporary designs. 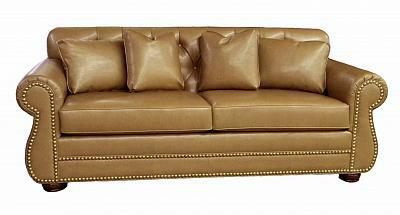 Barbara had seen a sectional in a local store using dark leather on the frame and lighter color fabric on the cushions. She loved the way it looked and asked us if we could do something similar. We sent her some of our leather and fabrics so that she could choose the right combination. 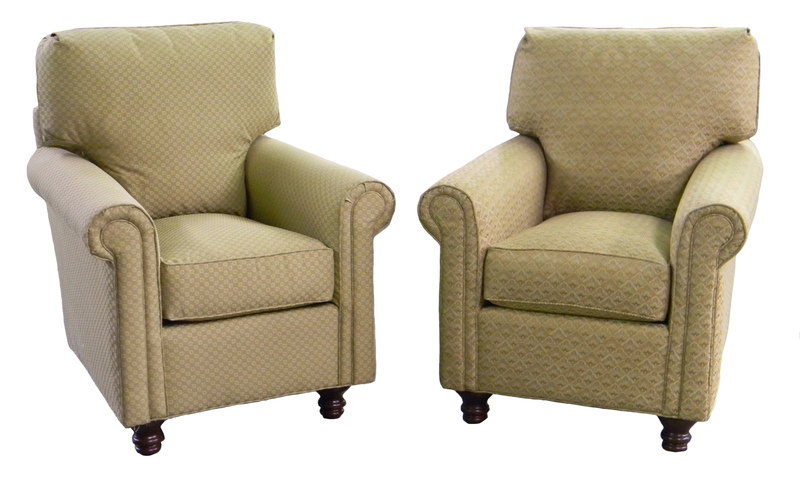 Barbara loved the casual look of our Byron style back cushions, but wanted the straight arms of our Crawford style. She wanted thicker seat cushions (she liked that look) and our fiber down cushion package. We added twin-wheel casters to her storage ottoman at her request. 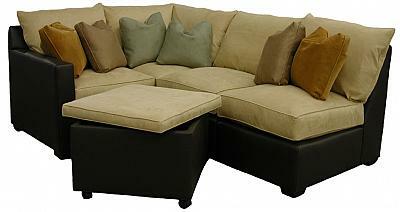 Her 4-piece modified Crawford sectional consists of a LF chair, corner chair and (2) armless chairs. Finished dimensions (L to R) are: 68.5" x 87.5". The leather is our Caprone and the fabric is Sultry Suede Dijon. Barbara added (6) 16" throw pillows in an all-down fill. Fabrics include Sultry Suede Cocoa, Lichen and Golden Rod. Kathleen and her husband are tall and have trouble finding furniture that fits them. They were in the market for a chair and a half and ottoman and found us! Kathleen had fallen in love with a fabric she found at a fabric store and wanted to participate in our C.O.M. (customer's own material) program. 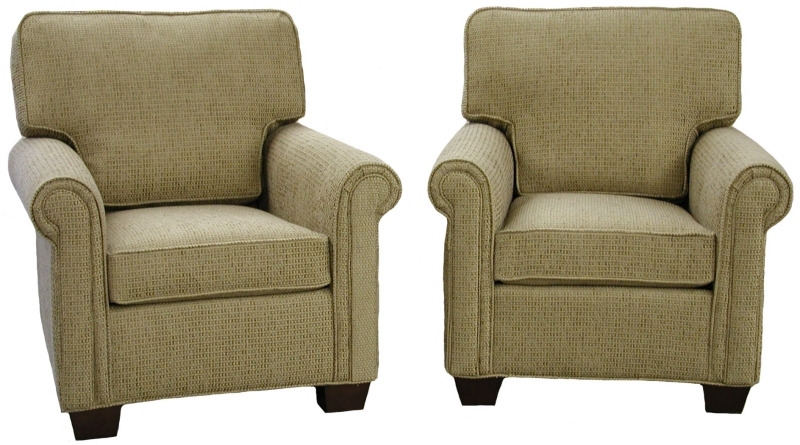 She liked our Kingsley style, but wanted to use rounded back cushions like our Roth style. Kathleen asked us to increase the seat depth of her Kingsley chair and a half to 24" and seat height to 21". The overall length is 55". 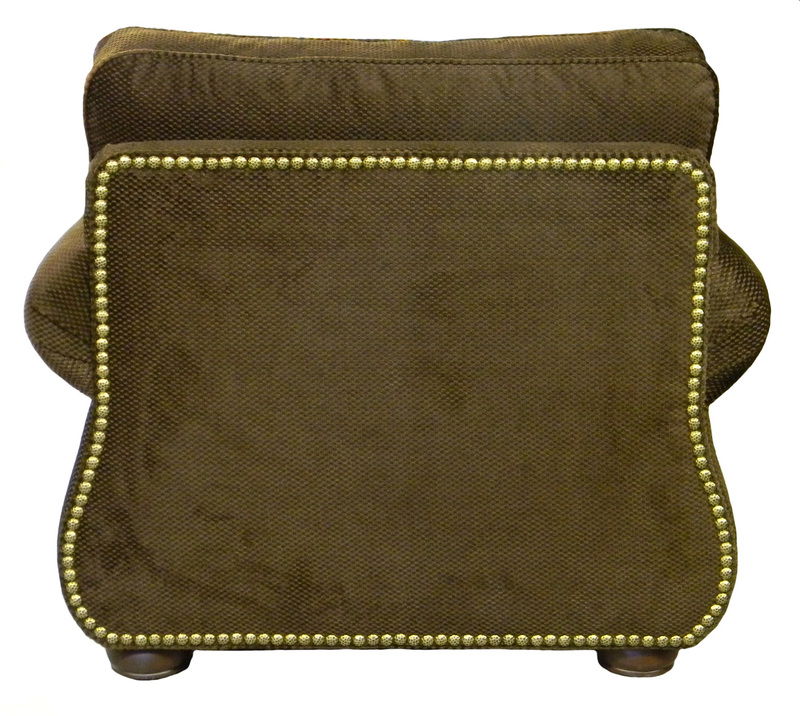 Kathleen added our optional Old Gold 'Z' finish nailheads around the arm facings and front border and around the front border of her Kingsley storage ottoman. 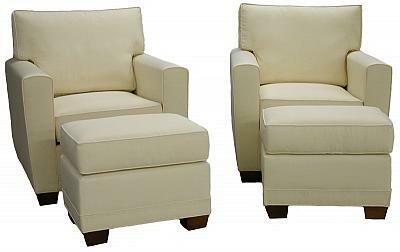 Both her chair and a half and the storage ottoman have our all-down cushion package and bun feet (fruitwood finish). 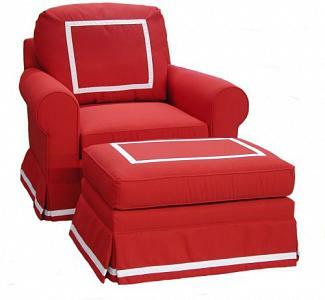 What a plush chair and a half and ottoman! Virginia Tech was renovating the women's volleyball locker room for the upcoming 2010 season. The design team wanted furniture that would be more residential looking vs. commercial looking, but needed quality construction that would last. They also wanted to support Made in the USA and we are so glad they found us! They needed plenty of seating for team meetings and wanted to incorporate a large round ottoman for extra seating and for fun! Their custom Crawford style 2-arm sofas are 96" in length and the custom round ottoman is 60" in diameter. We increased the border size of the seat cushions by 1" (adding thickness to the cushions) and used our poly back cushions for support. They chose Microdenier Baltimore Buckwheat as the fabric covering and black finish for the 2" tapered wood feet. Throw pillows are in Microdenier fabrics Baltimore Coffee and Rouge. Vivian fell in love with Brenda's sectional in this section and wanted one just like it for her home but using different colors and slightly different dimensions. Vivian selected our Microfibre Fairview Wine and combined it with a C.O.M. fabric that she found at a local fabric store. We think her combination of fabric turned out beautifully. To build Vivian's custom sectional, we started with our Roth style frame and used our Crawford middle bordered box style back cushions, which makes her sectional about 37" overall height. We added a visible "floor length" 7.5" kick-pleat skirt (sides that connect to other pieces do not have a skirt panel). Vivian upgraded the free ottoman to be storage and added a matching skirt. Her sectional consists of a LF loveseat, corner chair, and RF loveseat making the finished dimensions (L to R): 90" x 90". Melissa's fiance always wanted denim furniture, and what a great wedding gift this furniture will make! They have limited space in their family room and not enough room for end tables, so she chose the option of our removable stainless steel cup holders in the arms. This furniture will be used daily, so they opted for our poly back cushions which offers the most support and holds shape very well. 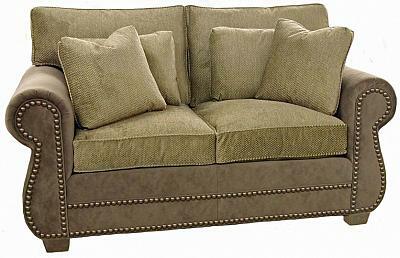 Melissa's Crawford style sectionals consist of a LF loveseat, RF chaise, LF chair, RF loveseat and free ottoman. The fabric is Denim Indigo. Darsh and Jagadish were searching for a living room sofa set that would provide seating for entertaining yet have a slightly whimsical appearance. They had some very specific design characteristics in mind and could not find what they wanted in retail stores. They were also looking for a high quality, domestically made product to support our economy. CarolinaChair was the ideal manufacturer to create this furniture. 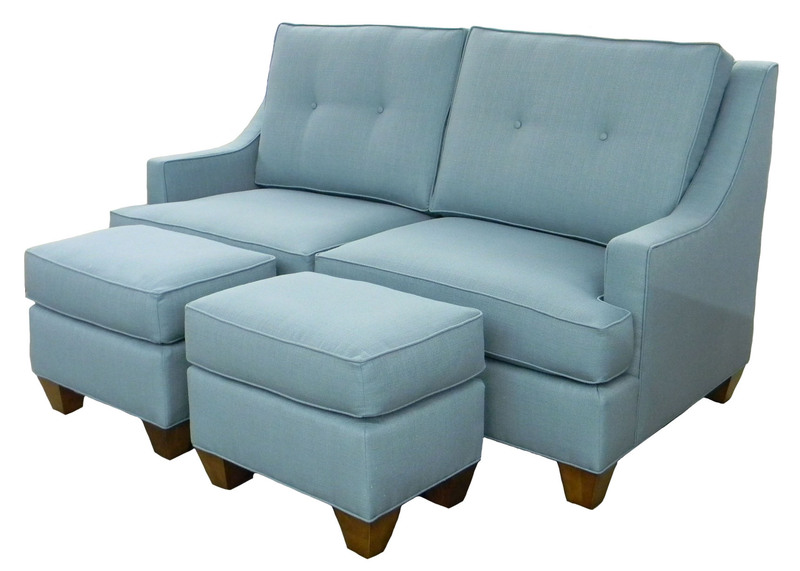 They started with a Hughes sofa and made several changes: simplified arms (our Valerie style arms shown on this page), tight back, single seat cushion with no welt, and 3" tapered wood feet. The original request of two chairs was upgraded to two chair & halfs in order to allow more flexible seating options. They selected Special Request Fabric Chloe Amber for the sofa and ottoman and Picayune Ginger for the two chair and a halfs. They finished off the set with contrasting 16"x16" throw pillows two for the sofa and one each for the chairs. Karen needed a sofa and chair that would work in their living room which is also their "family room." She was looking for something nice to entertain with - but comfortable enough to lounge in and watch movies. When looking in stores, she found furniture that worked style-wise, but the fabric or size would not work. Karen sent us a link to a style that she liked and asked us if we could build something similar, but to the length she needed (88") and using the fabric she wanted. The style was similar enough to one of our styles that we said yes ... we could build something similar. Karen selected Microdenier Baltimore Cocoa as her fabric and participated in our COM program for her contrasting 20" x 20" throw pillows. She added a matching swivel chair with a skirt. We are showing two photos of the same sofa the back cushions are simply arranged differently for this photo. Terri and Paul are empty nesters and were ready to replace their furniture. They wanted a large sectional that would allow for maximum seating (eight in their immediate family). They liked our Roth style, but wanted to use the Kingsley arm style without the curved bottom round (making the arm straight). They wanted to upgrade the free ottoman to be storage and increased the size to 42" x 42". They selected 2" tapered wood feet and Microdenier Baltimore Black as their fabric choice. 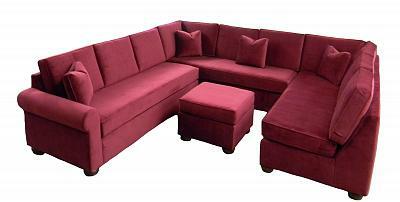 Their 5-piece sectional consists of a LF recliner, armless loveseat, curved corner wedge, armless chair and RF sofa with finished dimensions (L to R): 132" x 156.5". Terri e-mailed us after receiving the sectional and said they have separated the RF sofa from the rest of the sectional as it works best in their room that way. They like having one end open with no arms and love the flexibility of being able to put it all back together when needed! Karen was replacing existing furniture in her small family room. She wanted to be able to look from her front door to the back door without it looking cluttered or over furnished. She decided on a small sectional for the space. She liked our Crawford style but wanted some changes. To fit her space, we customized the length of her two 1-arm chairs and paired them with a curved corner chair which offers usable seating space. Karen's changes included using the center back cushions of the Crawford style, making single seat and back cushions, increasing the border height of the seat cushions to 5" (adding thickness), decreasing the arm height to about 20", and adding 3" tapered wood feet (fruitwood finish) She chose our standard seat cushions and our poly back cushions for firmness and support. Sultry Suede Saddle is the fabric selection. Finished dimensions of her 3-piece sectional (L to R): 85" x 85". Allison needed a sleeper sofa and liked our Crawford sectional style but wanted two arms on her sleeper. Not a problem! We simply added an arm to our 1-arm queen sleeper. Her fabric is Microdenier Baltimore Cornflower. Julie and Paul were our customers in 2004 when they needed to furnish their vacation home. They were now ready to refurbish their family room at home and had no doubt where to come for quality built furniture. They wanted a versatile sectional - one that could have multiple configurations. Julie saw the cup holder option on this page and wanted to incorporate them into her design. They chose our Crawford style sectional and the components are a LF recliner, RF recliner, LF chaise, RF loveseat and storage ottoman. We have displayed two possible configurations in our photos. The cup holders are stainless steel and can be removed for cleaning purposes. They opted for our standard seat cushions and our poly back cushions (for support). Their fabric choice was Microfibre Montego Cremini. Joanne had recently refurbished her family room and was looking for a sectional that would fit her space. She saw Elaine's and Mairi's custom creations on this same page and fell in love with that custom style (please read Elaine's and Mairi's stories below). She wanted to incorporate a curved corner wedge into her design, remove the skirt and 2" tapered wood feet. Her custom Roth 3-piece sectional includes a LF sofa, curved corner wedge, and RF chair. Joanne opted to upgrade her free ottoman to be storage. She selected our standard seat cushion filling, but increased the border size to 5" (adding thickness to the cushions). 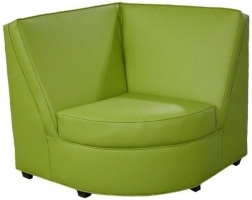 Her poly with fiber wrap back cushions offer added support and firmness (36" overall height). She added (2) 16" x 16" throw pillows. Finished dimensions of her sectional are (L to R): 127.5" x 77.5". Lamb Suede Cayenne was her fabric choice. Christine wanted two sofas for her living room. She had her own fabrics C.O.M. and liked our Hughes style, but wanted to make a few custom changes. She wanted our square bordered back cushions (overall height of 37") and she wanted to increase the length of the skirt from our standard 7" to 10.5". Christine used multiple fabrics for the skirt panels, skirt blocks and contrasting welt. View close up of sofa. Janine, a NY designer, has placed several orders with us for her clients. She wanted a sofa for herself and selected us to be the manufacturer for her personal furniture. Janine wanted a "scoop" arm style on an 86" long sofa. She preferred a 10" kick pleat skirt and bordered box style back cushions. Janine chose our fiber down cushion package and participated in our C.O.M. program for her fabric selection. Helm and Mary liked our Eliot style, but wanted to make some dimension changes to accommodate their short stature. 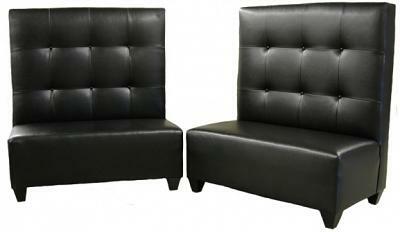 For both the loveseats and chairs, they wanted to decrease the seat height to 17.5" and reduce the seat depth to 20". They also asked us to extend the arms to the front of the frame (eliminating the T-seat cushions) and change the back cushions to be T-back cushions (like our English style with rounded corners). Poly back cushions and our standard seat cushions were selected. Helm and Mary opted for no skirt and 3" tapered wood feet. Fabric covering is Special Request fabric Tabernas Linen. Carol was remodeling her condo and converting a bedroom into a combination office/den. Because the space was small, she wanted compact chairs with ottomans. She couldn't find what she was looking for at reasonable prices, so she searched online and found our website. Carol sent us a photo of a style she liked and we used that photo as a guide as we built her two chairs. 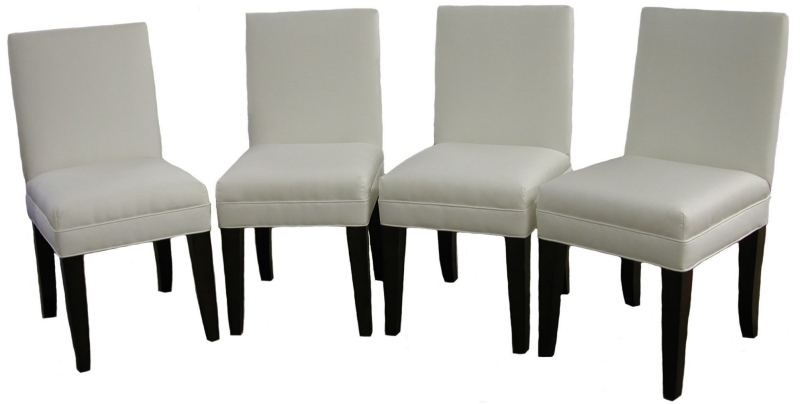 Her custom chairs are 33" overall length, 35.5" overall depth and 37" overall height. 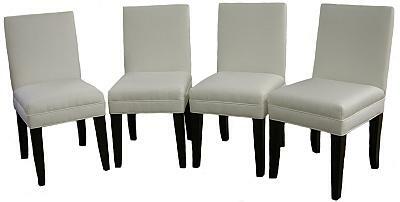 They have bordered T-back cushions, 5" border seat cushions, and 3" tapered wood feet. 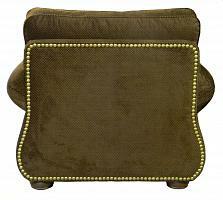 The custom ottomans are 23" length x 16" depth. She used Sunbrella Canvas Vellum as her fabric covering. Joanne wanted a chaise for her bedroom for reading purposes. However, her space was very small. She called and asked what we would recommend given her space constraints. She liked the Roth style and our Microfibre Bengali Gold fabric. We suggested and built a custom Roth RF (Right-facing) chaise with the following dimensions: 28" overall length, 20" seat width, and 50" overall depth. She opted for our poly back cushions and we also increased the height of the back cushions by 2" making the overall height 37". She added 2" tapered feet and (2) 16' x 16" throw pillows in Microfibre Bromley Pepper fabric. View photo of chaise with throw pillows. Janie wanted a chaise for her bedroom large enough to accommodate two! She liked our Crawford style but wanted to make a few changes. She wanted topstitching instead of welt, wanted to increase the border size of her seat cushions to 5", and wanted block style feet. Finished dimensions of her modified 2-arm Crawford chaise: 48" overall length, 38" seat width, and 72" overall depth. Janie chose our fiber-down cushion package and Microfibre Bromley Chocolate as her fabric covering. Nancy and Bob had some space constraints in a room they wanted to furnish, so they started looking in local retail stores for a smaller sofa and a chair and a half. They found some styles they liked - but weren't happy with the fabrics available or they liked the fabrics - but not the prices. Then they found us! They sent us a photo of a style they liked and asked us if we could build something similar. The style was very close to our Kingsley style. To make the modifications, we slightly flared the Kingsley arm and cut off the bottom "round" of the arm. We also inset the Kingsley arms to create the T-seat cushions and we decreased the arm and seat height by 2.5". We applied our Old Gold "Z" nailheads around the arm panels and front of the frame. Their custom Kingsley style (80") sofa and (53") chair and a half has Microdenier Baltimore Lichen as the fabric covering. 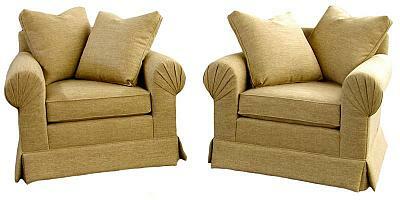 Nancy and Bob chose our standard seat cushions and our Poly with fiber wrap back cushions. Stacey, a repeat customer, wanted a loveseat for her daughter's bedroom. She had space constraints and needed us to change several dimensions in order for the loveseat to fit. We started with our Crawford style frame to make the needed dimension changes. Finished dimensions of her custom loveseat are: 58" overall length; 29" overall depth; 30" frame height. We reduced the arm width of our Crawford style to 2.5". Stacey changed the back cushion style to our Marquis scattered backs and chose our fiber-down cushion package. The 2" tapered wood feet are natural finish. Her fabric choice was Microdenier Baltimore Cherry Blossom. Sandy and her husband were building a mountain home in North Carolina and had a room that was very difficult to find and place furniture that would encompass a fireplace and TV. She searched everywhere before finding us! She loved the options she found when looking at this custom inspiration page. Sandy called us and explained what she was looking for in terms of a "conversational" type sofa and then sent us a drawing of what she had in mind. We built two 75" 1-arm curving sofas and based the frame off our Roth sectional style. She wanted our Crawford style bordered back cushions, making the overall height about 37". Sandy chose our poly back cushions and our standard seat cushions. Her fabric choices were Microfibre Hyatt Walnut for the frame and Special Request fabric M6569 5374 Ottoman for the seat and back cushions. Finished dimensions are (L to R): 150". Melissa and Eric wanted new chairs for their dining room table. They liked our Whitney style welted border Parsons Chairs with exposed wood legs in mahogany finish and asked us to make the top of the back of the chairs straight (vs. the arc or curve). They also wanted to be able to change the look of their chairs with slipcovers, but wanted us to make a slight variation in our slipcover style and showed us a photo of one they liked. They chose Sunbrella Canvas White as the fabric covering and Sunbrella Sailcloth Salt for the slipcovers. Ben and Kelly sent us an e-mail asking if we could build a double-sided (sociable) sofa in one of our styles. We told them we could and that we would just need to know 1) which style they liked, and 2) if they had a large enough entryway to get a BIG sofa into their home. They selected our Hughes sofa style, Chenille Erie as their fabric covering, and our fiber-down cushion package. The Hughes style double-sided sofa has an overall depth of 72". Kathy and Mike had a large family room to furnish. They had a rug in the room with multiple bright colors and they wanted to incorporate those colors into in the sectional design. They have three boys and wanted to be sure to choose a "performance" fabric (durable and easy to clean with soap and water) and cushions that would be more apt to withstand the rough and tumble play of their children. They selected our standard seat cushions and poly back cushions. 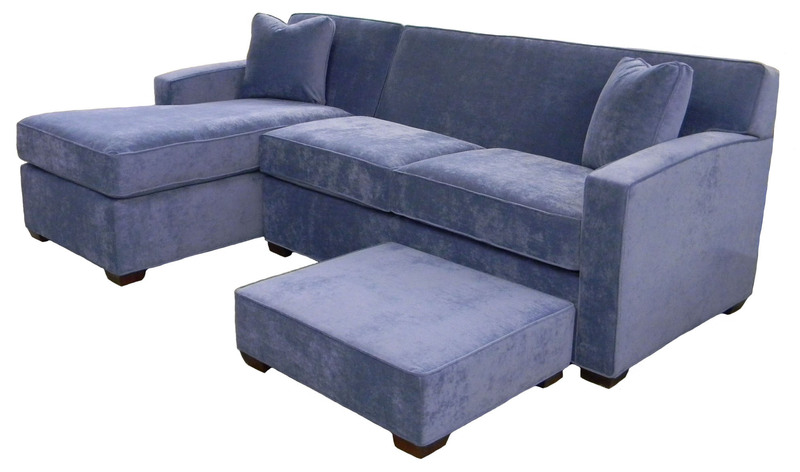 They liked our Roth style sectional but preferred our taller bordered box back cushions (middle backs of our Crawford style) which increased the overall height to 37". They wanted both chaises to have square front ends and be 65" in overall depth. To make their guests feel like they are sleeping in their own bed, they upgraded to our AirDream mattress. Finished dimensions of their 7-piece sectional (L to R) are 192" x 204.5". Kathy and Mike selected Microfibre Fairview Denim for the fabric covering and used Microdenier Baltimore Aubergine, Forest, Sunshine and Red for their optional contrasting throw pillows with fiber-down fill. Their custom storage ottomans are 45" x 45". Mairi saw Elaine's custom creation in this section and knew she wanted that particular sectional style for her home (please read Elaine's story). However, she needed a different configuration and different finished dimensions to fit her space. 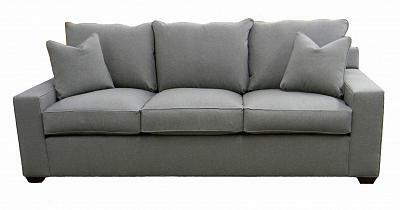 Her custom Roth 3-piece sectional includes a LF loveseat, corner chair, and RF sofa. She upgraded her free ottoman to be storage. Mairi selected our fiber-down seat cushions and increased the border size to 5" (adding thickness to the cushions). Her poly with fiber wrap back cushions offer added support. She added (2) 18" x 18" throw pillows with fiber-down fill. Finished dimensions are 84" x 115.5". Sultry Suede Silversage was her fabric choice. Alden converted a small office room into an exercise room and installed a large flat screen. Because of the room's proximity to the kitchen, it was the favorite place for her husband and kids to watch TV - in spite of its small size. Her husband was unhappy with the chairs they had in the room, so they looked for a small sectional, but to no avail. Nothing would fit their small space. Thank goodness they found us! We asked the measurements of the space they had to fill, and we modified our frames to perfectly fit their space. They chose our Crawford sectional style and we added 5.5" to the length of each armless chair. To better fit under a window, we lowered the frame height to 30". Alden requested our firmer poly back cushions and extra firm seat cushions. Finished dimensions are (L to R): 66" x 66". Fabric choice is Microfibre Bromley Cherry. Katy was expecting her first child and wanted a comfortable swivel-glider and ottoman for the baby's room. She liked our Hughes style, so we modified the chair frame to accept the swivel-glider mechanism. Her custom size ottoman is 28" (length) x 20" (depth). Katy selected Sunbrella Canvas Red as the fabric covering and participated in our C.O.M. program by sending us Gros-Grain ribbon for her decorative design. Libby is a repeat customer who ordered a Roth sectional from us in 2004. She was ready to redecorate another room and came back to us for a second sectional. This time she wanted a Crawford style with a skirt. She fell in love with our Microfibre Bromley Chocolate fabric and decided to use a different fabric for the storage ottoman lid. She participated in our C.O.M. program for that fabric. Her 3-piece custom Crawford sectional consists of a LF loveseat, corner chair, and RF queen sleeper. Finished dimensions are 93.5" x 113.5". Matt and Kortney had experienced sinuous spring seating system failure of furniture built by another manufacturer (see construction quality) and wanted the quality of eight-way, hand tied seating system which is our standard construction. They liked our Roth style, but wanted some customizations. They wanted to add some length to the RF loveseat (making it 72. 5"), add 1.5" of seat depth, add a skirt, increase the seat cushion border to 5" and use our poly back cushions - the cushion changes were for added support. 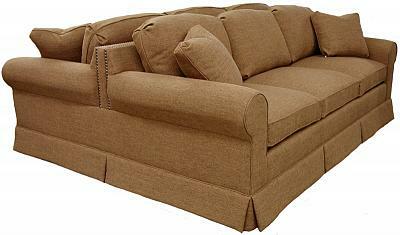 Their custom Roth sectional consists of a LF loveseat, corner wedge, RF loveseat and (2) ottomans. Finished dimensions are (L to R): 103.5" x 118.5". Fabric choice is Microfibre Fairview Taupe. Deeann was ready to replace her old sofa and loveseat and wanted to try a sectional in the space. Deeann's 91 lb. dog frequently shares the sofa with her so she wanted to increase the seat depth an inch or so. We added 1.5" of seat depth (making it 23.5") which increased the overall depth to 37". She also added bun feet, increased the border size of her seat cushions to 5" and chose our fiber down option for the seat cushions only. Deeann wanted a custom size storage ottoman, with rolling casters, large enough that she could use a table when needed and as a place to store blankets and other items. Her custom Roth 3-piece sectional consists of a LF loveseat, corner chair, RF loveseat and (2) ottomans. Finished dimensions are (L to R): 95" x 95". Fabric choice is Microfibre Hyatt Denim with contrasting welt in Hyatt Scarlet. Elaine liked our Eliot style which we offer in our stand alone collection, but she wanted a sectional. She thought the Eliot style was a "classic design" that would last forever. So, we told her that we could modify our Roth style sectional to look very close to our Eliot style. Modifications to our Roth style included changing the arm style and arm height (to 21.5"), insetting each arm to allow for T-seat cushions, changing to bordered T-backs, and adding a 6.5" kick-pleat skirt. Elaine increased the border size of the seat cushions to 5" and selected our poly back cushions for support. Her custom Roth sectional includes a LF sofa, corner chair and RF loveseat. Finished dimensions are 125.5" x 93.5". Microdenier Baltimore Cocoa was her fabric choice. Kid's Quest has been our customer for a number of years. They offer supervised hourly child care at various casinos across the country. As you can imagine, they need furniture that can stand up to rough and tumble kids play. We are showing just a few examples of furniture we have built for them. 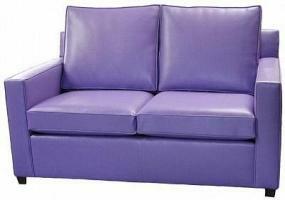 Their decor includes vibrant colors and they use a special vinyl/pleather for the upholstery. 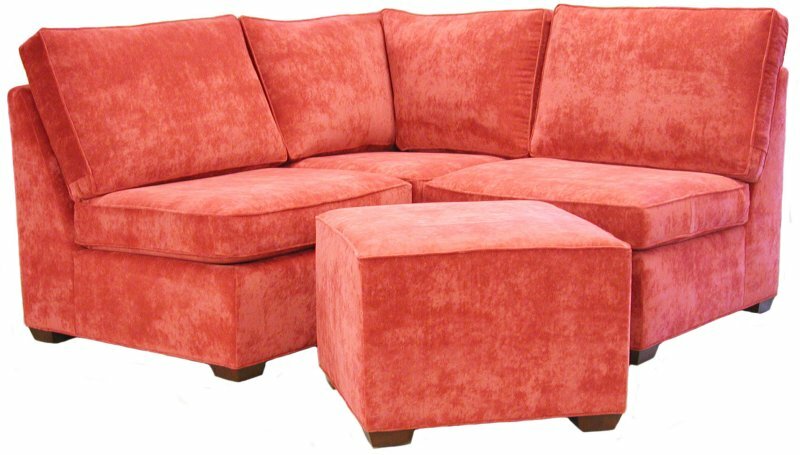 The components shown are a 76" ottoman/bench, (2) Hall style corner wedges with rounded fronts and poly back cushions, (1) Hall style corner wedge with a rounded front in a tight back style and a Hall style 2-arm loveseat with poly back cushions. Karla and Ed were renovating their newly purchased home and looking for a new sofa, chair and ottoman. They learned about 8-way hand tied furniture and wanted the quality construction that we offer. (Note: this quality construction is not found at the big box retailers or anywhere furniture is imported). Ed is an architect and likes the angular details of the Arts & Crafts style. They started with our Crawford style, but wanted to make several changes. They wanted the arms to be "chunkier", so we increased the arm width to 6". They wanted their sofa to be 96" in length and have 2 seat cushions and 2 back cushions. For added support in the seat and back cushions, they increased the border size of their seat cushions to 5" (adding thickness to the seat cushions) and chose our poly back cushions. Further custom changes included reducing the frame height to 29", reducing the overall height to 33.5", reducing the arm height to 23" and increasing the seat depth by 1" making the seat depth 22.5". Our Microdenier Baltimore fabric was selected for its durability and ease of cleaning and gentle shade of the Cocoa color would not overpower their cozy bungalow living room. Their custom storage ottoman is 34" x 25". Table Mountain Inn located in Golden, Colorado wanted to replace the queen sleepers in their executive suites. Amber contacted us after discovering our website because they needed furniture that would hold up over time and provide the needed comfort for guests. They reviewed this custom inspiration page extensively and asked us to build a sleeper style that incorporated several concepts from various styles. Specifically, they wanted the arm style of Tressa, a "tight back style" like Valerie, bun feet like Linda and a 2-seat cushion version like Laura. We started with our Roth style frame and made the custom adjustments mentioned, including increasing the seat cushion borders to 5". They upgraded all six sleepers (only showing two in the photo above) with our AirDream mattress. They participated in our C.O.M. program for their fabric selection. The Table Mountain Inn looks like a wonderful place to stay when you plan to visit the Rockies: www.tablemountaininn.com. Dr. Toth was furnishing two small rooms in his medical facility for out-of-town patients that needed to spend a few days while undergoing treatment. Since space was an issue in the small rooms, the sleepers could be no longer than 67". Dr. Toth liked our Hall style, so we decreased the arm width by 1.5" (making the new arms 3.5" in width). This small custom adjustment made the 2-arm sleeper 67" in length - a perfect fit! To make his patients as comfortable as possible, he upgraded to our AirDream mattress for both sleepers. His fabric choice was Microfibre Bromley Cherry. Denise and Erik were looking for quality constructed sectional and found our website. 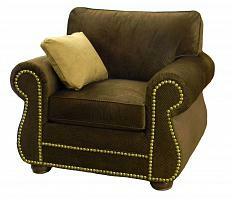 The liked our Byron style, but wanted to add nailheads as a decorative option. We applied our Old Gold 'Z' finish nailheads around the arm facings and around the front border of the components. Fabric covering is Special Request M7574 5401 Rhubarb. 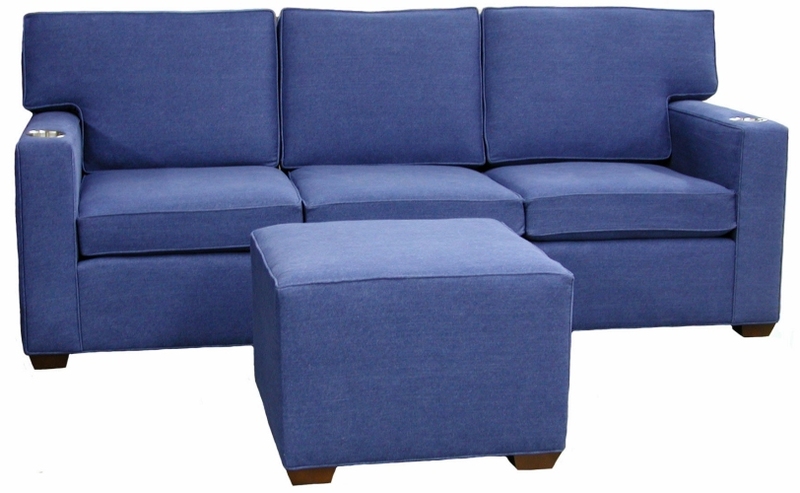 Their Byron style sectional consists of a LF loveseat, corner wedge, and a RF chair. Finished dimensions are (L to R): 103.5" x 78.5". Jenn was shopping for a sofa and (2) chairs for her new home after having a bad experience with a local retailer (in Florida). She called and asked if we could manufacture the Marquis style with fan pleated arms. Jenn wanted a fan pleated arm style to help "dress up" the furniture for a more formal look. She chose our Chenille Erie Rye as her fabric covering. Sue was helping her dad (Carl) find a sectional for his home. He wanted a traditional style, and liked our Roth, with some changes. Sue asked us to add a skirt and change the rounded back cushions to a bordered back style (like on our Yeats style). Her father wanted supportive back cushions, so she chose our poly back cushion package which is our firmest back cushion option, however, the cushions hold their shape very well. For added support and to raise the seat height 1", we increased the seat cushion borders to 5" (vs. 4"). Fabric color was very important for matching other decor in the room and our Twill Plus Crystal Blue was perfect for the sectional and the (3) 16" throw pillows. 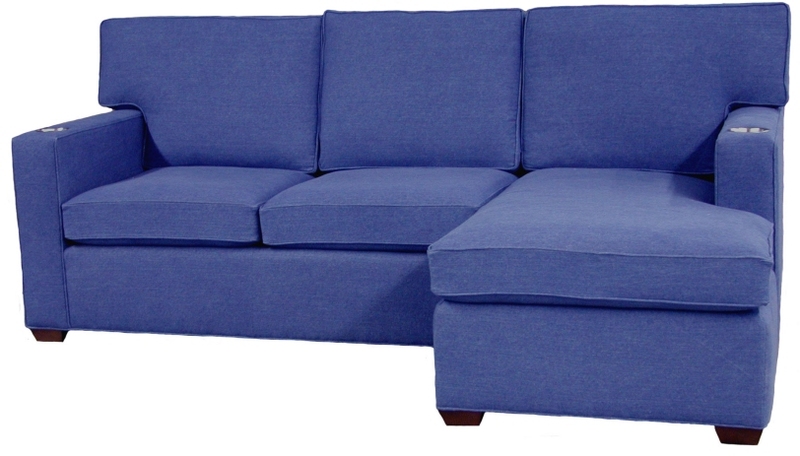 Twill Plus Medium Blue was selected for the free ottoman which will be used in another room of the home. Carl's custom Roth sectional consists of a LF chair, curved corner wedge, and a RF loveseat. Finished dimensions are (L to R): 78.5" x 103.5". Debi and her husband are empty nesters and "on a lark" decided to list their home with a friend who is a realtor. Their house sold in three weeks (yikes!) and they were out in six weeks. They gave the buyers much of their furniture as they really wanted new furniture anyway. Debi "googled us" and loved our website. 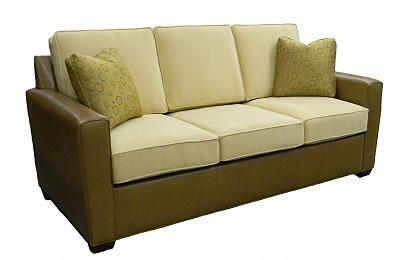 She liked our Bishop style sofa, but needed some custom changes including increasing the length to 104" and using (4) seat and (4) back cushions. Debi mentioned that her husband was a "big guy" (was a body guard for Sting) and needed extra support. We suggested our Ultra Support Package which includes a reinforced frame and an additional 2" of seat cushion â€“ which changes the standard 4" seat cushion borders to 6" seat cushion borders. We also increased the overall height from 33.5" to 37" and increased the skirt height to 8". 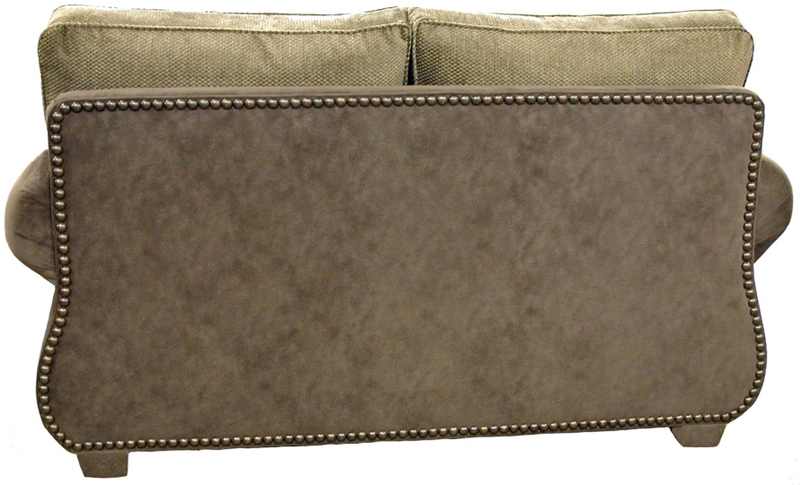 They chose our poly back cushion option and used Sultry Suede Cappuccino as their fabric choice. Keri and her husband were building a home and wanted new furniture for two of the rooms. Keri liked our Roth sectional style and paired a 1-arm chaise with a 1-arm queen sleeper (upgrading to the AirDream mattress). She wanted to change the LF chaise to have a square front/end with an overall depth of 65". She used Microfibre Bromley Apple and her contrasting welt is Microfibre Hyatt Spa. Finished dimensions of her 2-piece sectional are (L to R): 65" (depth of chaise) x 111". She added (2) 16" x 16" throw pillows in Microfibre Chandon Ocean. She ordered a Brooke loveseat and a custom Brooke ottoman using Microdenier Baltimore Coffee. Her custom sized Brooke ottoman is 48" in overall length. Tracy, a designer in New York, had previously ordered a custom sectional from us for one of her clients and they loved it! When she began designing another room in their house and needed a special size and configuration for the sofa, she didn't think twice about where she was going to order it. Her custom sofa sits against a bank of windows and into a corner where there are a set of french doors to the right. Tracy knew that she couldn't find a sofa and chair that would fit in the room without blocking the french doors, so she wanted to combine our 1-arm Crawford style sofa with a curved corner wedge. To fit the space exactly, we decreased the length on her LF sofa. Her clients can now snuggle on the couch without it being in the way! She chose Sultry Suede Garnet for the body of the sofa as red is an accent color that she used throughout their house. Tracy participated in our C.O.M. program for the cushion fabric which worked so well with the Sultry Suede Garnet and with the rug she ordered for them. The C.O.M. fabric she used for the ottoman and the throw pillows adds a bit of whimsy and "country-ish" look to the set and pulls the black out of the rug and wrought iron furniture in the room. Finished dimensions are (L to R): 123" x 45.5". 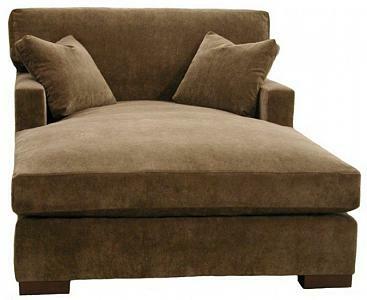 Lenny and his wife moved into a new house and needed a sofa that was a little more formal than their current one. His wife has always wanted an off white sofa. Unfortunately, they could never agree on the color because they have two kids (5 yrs and 1 yr) and Lenny didn't think a white sofa would work for the family. A friend told them about Sunbrella fabric (how it cleans easily with soap and water and will not fade in the sun), so they asked for several swatches. They really liked the material, so Lenny agreed to go with white. When looking at our website, they saw that modifications to our styles could be made so they sent us a link/photo of a style they liked. 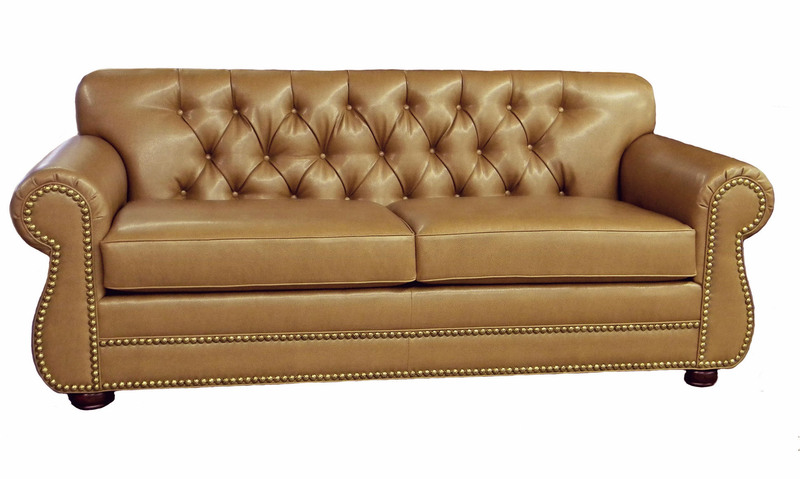 We modified our Crawford style sofa to closely resemble what they showed us. Their 89" 2-arm modified Crawford style sofa has 5" seat cushion borders and our fiber-down cushion package. They chose Sunbrella Sailcloth Shell as the fabric covering. Kim built a new house on the property where she has lived for 14 years. She came to us for furnishing several rooms. Her Brooke style sofa, loveseat, chair and (1) storage ottoman will go in her family room. Her fabric selections for those pieces were special request fabrics Finlay Garden and Abington Elm. The remaining chair and storage ottoman will be used in her master bedroom. Kim is currently in Interior Design school. We wish her much success and look forward to working with her after graduation!